Today I am sharing a fun and quirky tea pot from my collection. It is Tarzan! I love that Cheetah is on his shoulder and becomes the handle! Some pecs on Tarzan, eh? For some, when they think of Tarzan they hear Johnny Weissmuller, but for me, I think automatically of Carol Burnett! As a girl I used to love watching her on tv and always enjoyed her Tarzan yell. Having my tea in some of my fun tea pots really can turn a frown into a smile or just elevate my mood. I thought I would share a tea related card I made today for one of my girlfriends in my Jane Austen group. We are all tea lovers, so I love to make tea cards for this group of ladies. For this card, I broke out my February Simon Says Stamp card kit, and used the pretty papers and a few of the fun stamps. 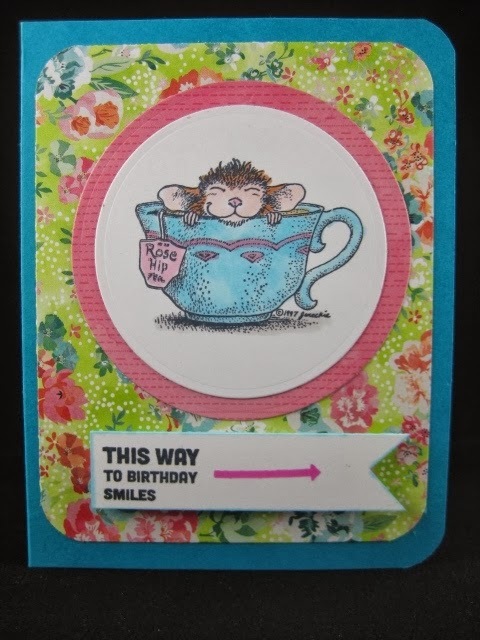 For the focal image I used an adorable House Mouse stamp. Isn't he cute? Thanks for visiting today! Until next time! That's adorable - I love the custom of having a cup of tea with your pinky out. We live in Berlin and all our friends from home (England) always bring us Yorkshire tea - it's the best! What a darling birthday card! Now here's a teapot I have never ever ever seen before! Also the Sherlock Holmes one below! So glad I visited! this teapot makes me smile. What a unique and fun teapot! Ah yes, I do remember your Jane group and how I drooled over the idea and wished I could be there with you! I love this teapot, so funny! And I love the card! 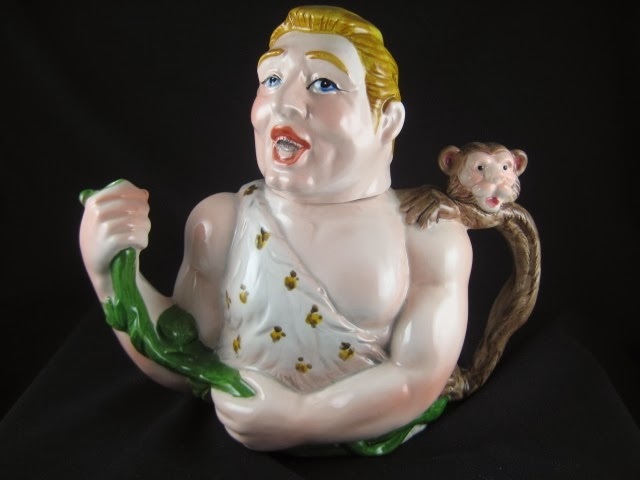 That's a fun tea pot, and I remember Carol's Tarzan call very well. Gosh, I loved that show and of course I Love Lucy. Not much on television to make us laugh like that any more, is there? The card is sweet, I made one for each family member that's visiting with us on vacation. Hope your hubby loves the bag you decorated for his gift.